Pure on-demand software-as-a-service businesses are difficult to build. It is the rare B2B SaaS startup that masters all the Dos and Don’ts of SaaS Success from the beginning. When the going gets tough, many find themselves falling back on traditional enterprise software approaches to product delivery and business operations. However, there is a big difference between making the strategic decision to deliver your product in a hybrid model and stumbling into a hybrid model through tactical mistakes. In the first instance the market requirements demand a hybrid approach, in the second executive management is simply not disciplined and creative enough to avoid it. In an earlier post, I presented the relationship between pure on-demand SaaS and it’s closest hybrid cousins: managed services, packaged software, and enterprise software. The four models differ along the dimensions of pure commodity product (SaaS and packaged software) and pure online delivery (SaaS and managed services). When a business travels down the hybrid path, it is making a choice to deviate from pure on-demand along one or both of these dimensions. The farthest deviation being enterprise software. Seems straightforward enough. So, why avoid a hybrid approach? Let me state up-front that there are markets that absolutely demand a hybrid model—-a great example is anti-virus software, which requires a fat client for rapid response (packaged software), Internet delivery of virus definitions, software updates and threat alerts (SaaS) and a semi-automated, labor-intensive process for collecting, analyzing and categorizing threats (managed service). However, it is much more often the case that complex market requirements provide the rationalization for poor management rather than the rationale for good business strategy. Competitive advantage in SaaS is built by leveraging the Internet to lower costs through economies of scale or to develop differentiation through network-native capabilities. Moving away from a pure commodity product (toward managed services) breaks economies-of-scale, while moving away from pure online delivery (toward packaged software) breaks network-native capabilities. 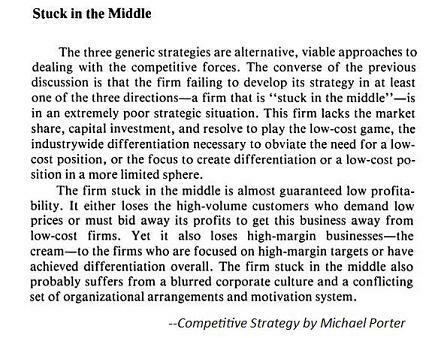 Deviation due to a lack of discipline without compelling market requirements results in the textbook failure of competitive strategy: getting stuck in the middle. Sound familiar? This is the primary reason that some of today’s most well known SaaS companies have yet to attain profitability. It has nothing to do with the so-called up front investment costs of building a SaaS business (seriously…do NetSuite, Omniture and Success Factors ever plan to stop posting losses?). They have given up too much competitive advantage in pursuit of revenue from markets where they are not competitive or from customers that they cannot serve profitably (as evidenced by this nice little financial analysis by Bob Warfield). Many markets present challenges along both the dimensions of product uniformity and online delivery. Unique customer processes, complex technologies and heavy integration requirements for example can all create serious strategic hurdles. To overcome them successfully, it is essential to be clear about exactly the business you want to be in and exactly where your competitive advantage truly lies. If your competitive advantage comes from Internet-based innovation, but you have very unique and demanding customers that require you to customize your product or services, then mixing SaaS with a managed services approach might be the right choice, because the premium you can charge will cover the hit to your cost structure. If you are a low cost, commodity SaaS player, buy our product requires lots of configuration and integration to be useful, then having some offline software components and on-site professional services for on-boarding and account management might be the preferred solution as long as they are highly standardized and don’t undermine your fundamental cost advantage by breaking the uniformity of your primary SaaS infrastructure. But, don’t get stuck in the middle by chasing revenue that forces you to give up your core competitive advantage and results in the loss of long-term business profitability. I have thinking and dealing with this challenge for a few months now. I see the hybrid approach a inevitability if you are dealing with Government agencies. I just concluded a post going through the scenario of federal government deal http://www.prudentcloud.com/saas/saas-government-20062009/. Would love to know what your thoughts on the same are. Very interesting blog, right on the button… I have just witnessed first hand the forces that pulls a potentially successful company in directions that dilute that potential. thanks for the article, interesting read. Just like Subraya said, I think the hybrid approach is inevitable in some cases. … so we want to allow customers to switch back and forth between on-premise and fully managed, but we have been careful not to go full SaaS. I believe a software publisher that still provides customers an on-premise software purchase is completely missing the advantage of SaaS, and is therefore not a real contender for the high stakes game. The pace of change is becoming so rapid (I could have said rabid?) that any attempt to spread the innovation into on-premise or hybrid provision is going to slow a provider and cause them to be uncompetitive. For Oracle, Microsoft and SAP, this is more true than ever. Smaller, pure-SaaS companies are going to drive innovation so fast and so efficiently that it’s going to be impossible for the giants to keep up. Providers of hybrid SaaS models will show their inherent weakness when they begin to take 6 months to a year between major dot releases. This is too slow for the post-SaaS market. My, what exciting times we are living through!